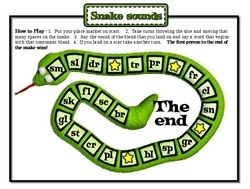 In this phonics game, students will get to practice their initial consonant blends by trying to get to the end of the snake. When students land on one of the consonant blends they must make the sound of the blend and then say a word that begins with that sound. This is a great fun way for students to practice their phonics skills.